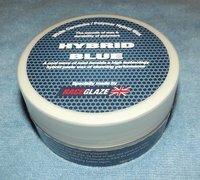 This 200ml jar represents excellent value, providing lower cost per coat than the 100ml jar and perfect for anyone wishing to try a really good wax for a modest outlay. We predict strong sales. Having bought this as a blind buy as there aren't many reviews about I absolutely delighted with it. It spreads very well and removes 5-10 minutes later effortlessly leaving a very rich finish with good beading and sheeting characteristics. It lasts well too and for the price its selling for its seriously a bargain. This one's a keeper for sure. It looks incredible on black and glows on warm colours. You will not be disappointed at all if you buy this. Package arrived day after ordering, thought would use on my wife's micra to try it out. Went on very easy, much easier than I though any wax would. Did not take long to apply, very easy to buff. Gave a lovely shine first coat, will give second coat tomorrow. So far very good product easy to use, and smells nice to. "Thank you for updating me with the latest regarding the car cover, much appreciated. Most companies don't bother communicating with customers between the order being placed and delivery. It's always good to hear the current status and to know that the order is still in progress, so thank you."